The Sun-Moon angle of separation now is past full (the 180° of the total 360° zodiac circle is Full Moon). We have now entered and are well into the Waning Disseminating Phase which is 225 – 270°. The Moon now wanes, grows smaller. If we put this phase in perspective by comparing it to the circle of the zodiac with Aries as first house, we’d be around the 8th house or or 9th house right about now–the area of “The Shaman”. The Shaman who has a social identity too. So at this time we need, like the social shaman, times for periodic withdrawal like a shaman would need while at the same time giving something, “disseminating” something as the name implies and as a shaman does. We now have some wisdom which we gained from the Full Moon which we can share with others. Just as a side note, it’d be nice to be able to see the Moon wane in our local sky here after the huge attention-getter that it was last week; but alas, where I currently reside, the Moon has been camouflaged by dark clouds and rain for days now. The homeward journey of the Moon has started, at least symbolically. In comparison to a human life cycle, we are now past mid-life. The Moon is closer to death than to birth. 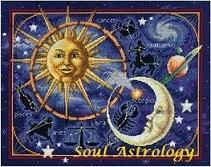 And in our psyche during this Moon phase, there is a certain detachment from worldly concerns. As I typed that last sentence, I laughed thinking how I took off for the gym to workout yesterday despite the area’s heavy concerns about a tornado warning and I joked with my daughter saying, “… so in case a tornado hits me, you will find my body somewhere between home and the YMCA.” In this phase, we have the understanding that everything must die and our orientation to life changes with that mood. We are focused both inwardly and outwardly and in that split focus we can see that we should live our life every single day as if it were the last day we have on earth. We are challenged in this lunar phase, in some way or another, to get over our own self-importance and to diminish our self-involvement or egocentric views. Something about this current waning disseminating energy encourages less selfishness and to make other people’s concerns more important than our own. We also realize “how rare and precious we all are” –to borrow a phrase from the movie, CONTACT. And with this perspective, we stop sweating the small stuff–as the saying goes. Right now the Moon looks like its missing an edge of it’s face. In this phase, says Rudhyar, people like to teach others what wisdom they accumulate in their internal search for understanding. This is the time of the month that a psychic who is also a medium will likely receive the most requests to bring a message from a loved one on the other side. We will most feel like connecting to ancestral energy or the ‘old’ teachings at this time. In this phase people are tempted to want to give or ‘give back’ for the blessings that they have received and in this lunar phase, the psychic may feel like giving a free reading or do something in order to give back for their blessings. Also, they may receive love offerings/donations in this phase. 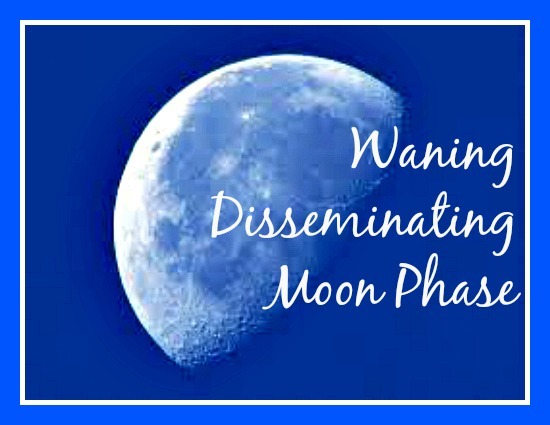 In this phase the psychic wishes to remain engaged with others but will soon enter a withdrawal phase again as the Moon continues to wane. There is a feeling in this phase of longing to commune with kindred souls as well as having the recurring realization that life is short and precious as previously mentioned. PERSONAL NOTE: As the Moon has been in the disseminating phase it was with great pleasure that I created a website for my daughter, who had been asking me to help her with that. I noticed that I had a strong impulse to share with her what I’d learned in my online computer work and to be helpful to her. There was an acute awareness that I had valuable information and abilities that could be of great service to her. I’ve also felt a stronger connection to my family than is usual for me and the inevitability of the passage of time and how much I love them.